Stone Creek Restoration, a subsidiary of Stone Creek Builders, is lifting homes into compliance with the new NJ flood map for Monmouth and Ocean Counties, including the towns of Sea Bright, Monmouth Beach, Union Beach, Point Pleasant, Manasquan, Long Branch, and Mantoloking. After Hurricane Sandy, FEMA developed new guidelines for reconstruction. Based on its studies, FEMA has now released a new Flood Insurance Rate Map (FIRM). Even a few inches of water causes thousands of dollars in losses. After a flood, hundreds of businesses won’t reopen and many residences are abandoned for inadequate insurance and inability to pay mortgages. Better preparation can mitigate some of the damage. With Mother Nature, there’s no guarantee the NJ flood map is 100% accurate. Coastal communities will always be at risk. FEMA’S latest NJ flood map expands flood hazard areas. NJ towns are using the FEMA flood map to update flood zones, flood insurance requirements, and building regulations. The FEMA website (http://www.fema.gov) has a location system to see which properties are in flood zones in NJ. Insurance rates and building codes are based on these zones. The best time to mitigate is during reconstruction. Stone Creek Builders uses Base Flood Elevations (BFEs) on FEMA flood maps to advise property owners about flood levels. If a structure’s elevation is below BFE, a house lifting is indicated. 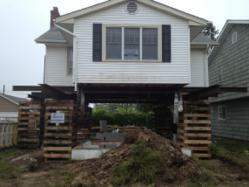 House raising projects are commonly done in flood zones in NJ. A NJ house raising lifts living areas above anticipated flood levels. Information on house lifting is in FEMA’s Manual (http://www.fema.gov/pdf/rebuild/mat/sec5.pdf). NJ house raising requires evaluation of the structure from soil to roof. As a general contractor, Stone Creek coordinates environmental and engineering services for NJ house lifting. We review lift height, soil compression, structure height, and existing soil and foundation condition. We may advise adding to or retrofitting the foundation, moving the house and installing wooden piles, and/or reconstructing with a concrete column foundation. A NJ house lifting is a large undertaking, but not raising a structure may result in 10 times the insurance cost and may risk a complete loss in a flood. Informational resources for a property owner considering a house raising are available at FEMA’s Coastal Data web page (http://www.region2coastal.com/bestdata). Before you raise the roof, contact Stone Creek Builders at (732) 566-0395 or visit our website at http://www.stonecreekbldrs.com for more information.